The space between and around the stars, the inter- and circumstellar medium (ICSM), is filled with a highly dilute mixture of atoms, molecules and dust grains. It is a fascinating laboratory, in which new stars and planets are formed. The physical conditions are extreme; temperatures are low, radiation fields are intense, and particle densities are exceedingly low. Nevertheless, more than 160 different molecules have been identified in space, including very complex species, both stable and highly transient. Evidently, despite unfavourable conditions a vigorous chemistry takes place in space. Icy dust grains form during the different steps of star formation that starts with the gravitational collapse of an interstellar cloud. Gas phase species condense onto the 10–30 K cold grains, and the resulting ice mantles are composed mainly of water with traces of carbon dioxide, carbon monoxide, and methanol. Typical ice mantles are 50 to 100 monolayers thick. They provide a suitable environment where atoms and molecules can meet and react. 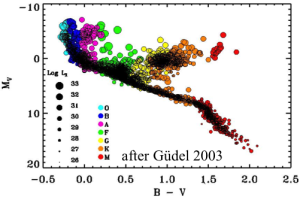 Later in the star formation process, during the proto-stellar phase, circumstellar ices are subject to energetic processing from the young stellar object, eventually releasing chemicals into the gas phase. Dense molecular clouds are dominated by atomic hydrogen UV fluorescent emission (Ly-α) induced by cosmic ray impacts and provides a significant radiation source in otherwise dark regions. During the phase in which the cloud core collapses and the star is still deeply embedded, the UV radiation density in the gas is drastically reduced, and the dominant ionizing source is X-rays. Indeed, unless a low-density region allows UV radiation to escape from the innermost region of the envelope, its influence on the chemistry is restricted to a small volume surrounding the star. Almost all stars are X-ray emmiters, see Fig. 2. 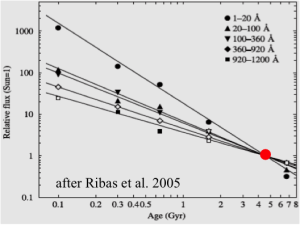 In addition, in young stars, X-rays may dominate the high-energy emission. 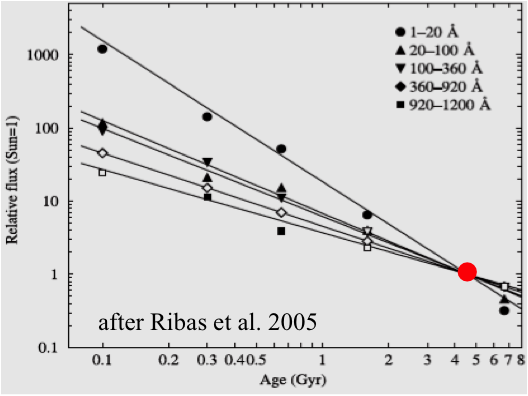 In the case of a solar-type star of 100 Myr old, the X-ray flux is larger than the extreme UV, and it remains within a factor of two up to 1 Gyr old (Fig. 3). Such a copious hard emission must affect the chemistry of interstellar material. LIFE (Fig. 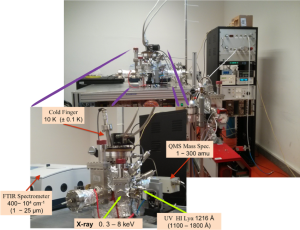 4) has been designed for the study of the interstellar ice analogues under the effects of high energy radiation. LIFE is an ultra high vacuum chamber, 2×10-11 mbar. The pressure monitored with a ion gauge (VG-IGC3), the pumping system of the chamber includes a turbomolecular pump (BOC-EDWARDS, capacity 450 l/s), which is backed up by a small turbomolecular pump (Edwards ETXT75DX 70 l/s) connected to a diaphragm pump (VARIAN XDD1 33 m3/h), a getter pump (SAES D1000) and two cryogenic pumps (1500 and 800 l/s). 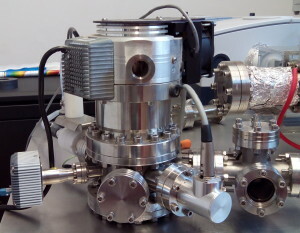 The chamber is equipped with a closed-cycle helium cryostat mounted on a freely rotatable platform to place sample ices towards different diagnostic instruments and radiation sources. A cylindrical radiation shield (Fig. 5) is mounted all around the cryostat leaving open two rectangular areas only in correspondence of the IR transparent substrate. 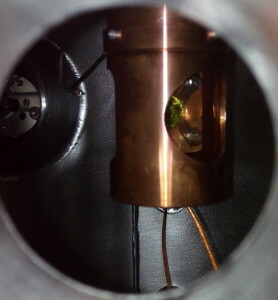 In order to obtain the highest thermal conductivity, indium of high purity is used to connect the sample holder and the radiation shield to the cryostat. The temperature along the cryostat and at the sample is detected by two silicon diodes. A tunable thermoresistence in contact with the sample holder can heat the sample from 10K to room temperature. A LakeShore 331 temperature controller monitors the temperature with a 0.1 K accuracy through the two diodes and the tunable thermoresistence. The evolution of condensed phase are recorded by Fourier Transform Absorption Infrared Spectroscopy in transmission (FTIR). The mid-FTIR (Vertex 70) comprises the 8000 – 600 cm−1 range with a resolution that can be choosen 0.4, 1, 2, and 4 cm-1. In order to avoid atmospheric water vapor and carbon dioxide gas contamination on the IR spectra, the IR beam path is continuously purged with free H2O and CO2 air. The angle between the substrate and the IR beam is 90°. The QMS (Hiden analytical Hal 301, 1-300 amu with 0.1 amu resolution) is used for monitoring the vacuum composition, the sample purity during the deposition process, the desorbing gases during irradiation and warm-up of the ice. 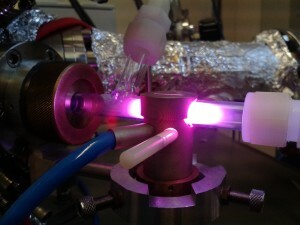 This experimental technique is used to study the chemical composition of an ice via temperature programmed desorption (TPD). In a typical TPD measurement a constant heating rate is applied to the ice to thermally desorb all condensed and newly generated molecules. A combination of FTIR and QMS techniques is key in the study of inter- and circumstellar ices, monitoring simultaneously and in real time the ice and gas compositions. The Life system is provided with a gas line, Fig. 6. A mixture of a maximum of 8 components (2 liquids and 6 gases) can be prepared with the desired composition. 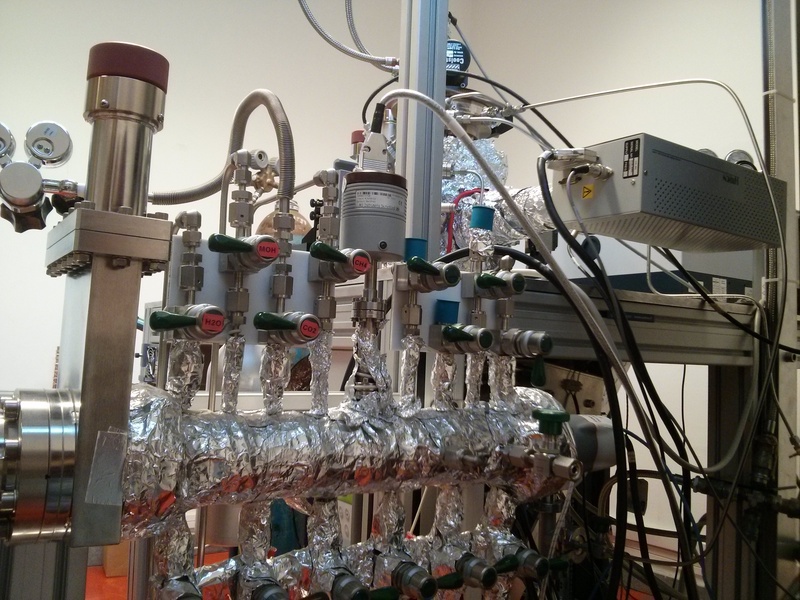 The gas line is evacuated by a turbo-molecular pump (Pfeiffer Hi cube) with a base pressure of ~10-8 mbar. When the desired composition of the gas mixture is obtained, it is deposited onto the cold (10 K) substrate through a capillary connected to a needle valve. A second capillary and needle valve are devoted for corrosive gases like NH3. Electron impact X-ray source (left panel of Fig. 7) built and tested at the INAF-Osservatorio Astronomico di Palermo. Such source can operate in the 0.3–10 keV range by selecting anosd of different materials. The source produces X-rays by focusing an electron beam emitted by a hot (∼3000 K) tungsten filament onto an anode. Microwave-discharge hydrogen-flow lamp (MDHL), right panel of Fig. 7. It provides intense Ly-α (or HI line) emission at 121.6 nm and molecular H2 emission bands in the 140–170 nm range, with a flux of order 1015 ph s-1. An 88% transmittance nickel mesh (Precision Eforming) is used for monitoring photon flux in real time during irradiation.